This unused, and perfect condition, box of Ilford Transparency Holders has beeen kindly donated to me. 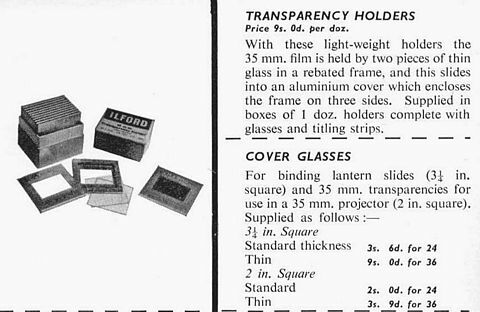 Sometimes called 35mm slide mounts, transparency mounts or transparency holders, these boxes of 12 aluminium transparency holders were sold by Ilford during the 1950s at 9shillings (45p) per box. By inserting each of your precious 35mm colour slides (transparencies) between two 35mm sized 'cover' glasses, and then sliding together the two aluminium surrounds, the resulting 5cmx5cm colour slides would be protected against finger marks and other accidental damage. The two halves of each transparency holder within this maybe 55 years old pack, still separate easily to enable a transparency to be inserted and then slide together again smoothly, forming a tight snug fit when fully closed. A sheet of 12 stick on titling labels was included within each box. Colour was an expensive 'medium' in the 1950s (black & white prints were still the 'norm' for most people under most circumstances) and photographers were encouraged to protect and preserve their colour slides by mounting them between glass. It seems these transparency holders may have originally been sold in a cube shaped box, as in the circa 1954 illustration alongside. Below, the transparency holders are shown in a more slim-line box with the holders packaged in two side-by-side lots of six.